The Xamarin.Forms Circular Gauge is a data visualization component that helps display numerical values on a circular scale. It has highly customizable features, such as scales, pointers, ranges, and annotations. 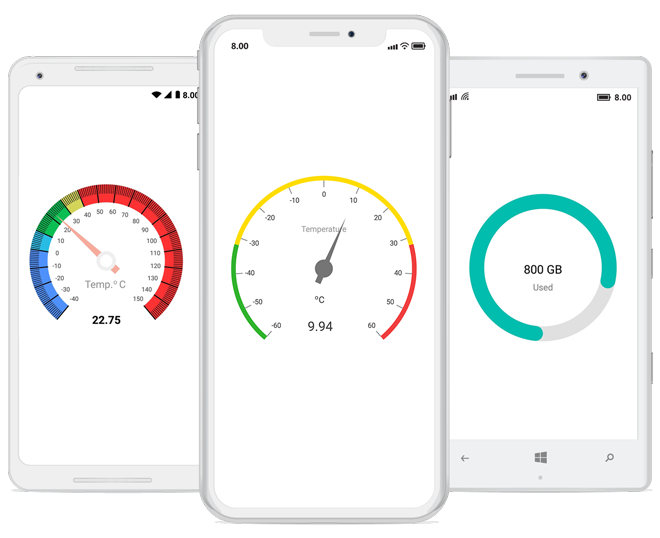 The Xamarin.Forms Circular Gauge which is also known as Radial Gauge is a data visualization component that helps display numerical values on a circular scale. It has highly customizable features, such as scales, pointers, ranges, and annotations. Also, it offers creation of speedometer, temperature monitor, dashboard, meter gauge, multi axes clock, modern activity gauge, direction compass, etc. The scale of the Xamarin.Forms Circular Gauge is an easily customizable circular arc in which a set of values can be plotted based on business logic. You can customize the look and feel of the default labels and ticks and add multiple scales to the gauge to design it like a clock, dashboard, speedometer, etc. Also, you can change the scale direction to clockwise or counterclockwise. A range of the Xamarin.Forms Circular Gauge is a visual element that helps you quickly visualize where a value falls on a circular scale. You can add gradient range to create a smooth color transition. Indicate a current value by using the highly customizable needle-type element. You can change the needle pointer type to a rectangle or arrow and add more than one needle pointer to a scale to indicate multiple values. A range pointer is used to indicate the current value relative to the start value of a circular scale. You can add a rounded range cap to the start, end, and both sides of the pointer to provide a rich styling experience. Add multiple range pointers inside a scale to indicate multiple progress activity. Indicate current values by using different types of marker pointers. You can set the marker pointer type to a built-in shape, such as a triangle, inverted triangle, square, or diamond. Annotations display metadata about a Xamarin.Forms Circular Gauge at specific points of interest in a plotting area. You can add custom view, image and text inside the gauge using this support. The Xamarin.Forms Circular Gauge control provides a visually appealing way to view pointers with animated transitions for a certain time span. You can see smooth pointer transitions by moving the pointer from one place to another.